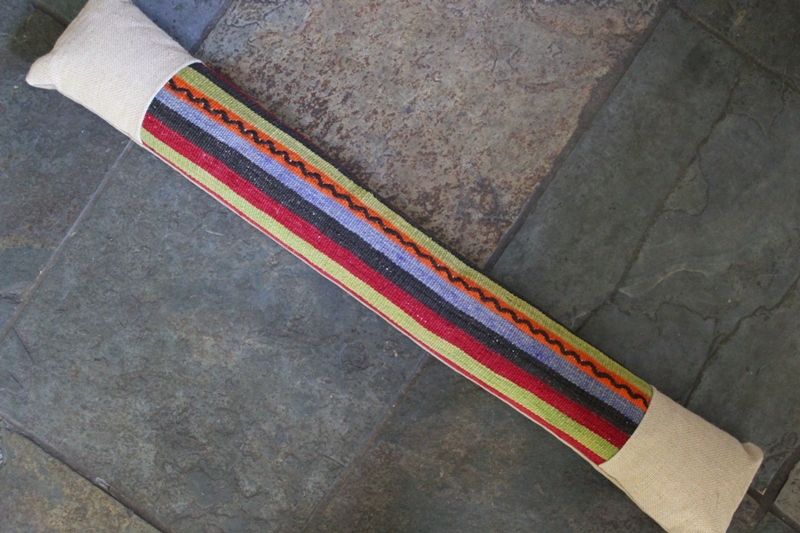 Our Kilim Draught Excluders are hand made from Antique Hand Woven Turkish Kilim in the UK. Each one is unique. Kilims are flatwoven by hand rather than hand knotted to a pile like a rug and mostly made of wool onto a cotton or wool base. Kilims have been made in Turkey and many other rug producing countries for centuries for the weavers own use and for sale and export. Very collectable and desirable, Kilim has always been a stylish addition to create a gorgeous, sumptuous feel to any interior decor. Each Kilim Draught Excluder is cut from a larger Kilim (sometimes called a Flatweave) by hand and sized accordingly, ready for our craftsmen to sew a luxurious cord or suede like backing material, in a neutral colour to the reverse. Some are trimmed with hessian for a natural country style. All of our Kilim Draught Excluders are zip fastened so that the cushion pad can be removed should they require cleaning*. This example has been made from one piece of Kilim with traditional designs and colours. We think it is stunning! Let the warmth of the orient keep the cold outside your doors. *Please don't attempt to clean Kilim Draught Excluders with any bleach based cleaning products as all Kilims are dyed using natural and vegetable dyes and colours may run causing irreversible damage. If you are unsure please contact us for advice or to ask about our cleaning services.